I’m David and I work in Facilities Management. I joined Number 10 in the year 2000 and I would normally describe myself as someone who doesn't believe in the supernatural but this is what happened in the Small Dining Room, shortly after I started. We were doing a recruitment exercise for a new member of staff and I had booked the Small Dining Room to do that interview. I arrived very early, about six o’clock in the morning and rather than going straight to my office I walked up to the dining room just to check the table and chairs were positioned correctly. The early hour meant the room was in total darkness. With no natural light coming from the windows and that I hadn’t switched the electric lights on inside the room I was reliant on the wash of light from behind me in the service corridor and just stuck my head in the room. I was immediately conscious of some light from underneath the doors that go through to the State Dining Room and knowing we’d had a couple of incidents of lights being left on overnight I moved into the room to check this. As I crossed the small dining room to the two large doors that open up into the State Dining Room I passed the end of the table, and absolutely jumped out of my skin because someone walked past me! I’m talking about a space of a couple of feet, but because of the darkness I hadn’t seen the person. On spinning round, the light from the door I had entered through showed I was on my own. What really got my attention was that I heard the sound of a taffeta dress moving/rustling, and without wishing to sound dramatic, definitely felt a presence. Nothing malicious, or otherwise, but it definitely felt like someone was with me. He then proceeded to tell me that there is a lady in a white ball-gown who goes between the State Dining Room and the Pillared Room! With the short period of time I had worked at Number 10, this was news to me, and as I said, I’m the kind of person is sceptical of this kind of thing without some kind of evidence. Except that it happened to me! It’s something I don’t often relate to people because it still sends shivers up my spine. Since then I've read up in a few London ghost books, it’s all mentioned, so maybe, just maybe, I've met the Lady in White! The following week, I made a point of coming down to the state rooms after evening receptions when the lights were off, to try and re-create the moment, and, here I am, thirteen years later and, I haven’t had any further contact. 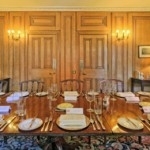 You can take a tour of inside Number 10's state rooms with the virtual tour found here. To someone like me, that's not a scary experience, although I understand it must be a mystery to a skeptic. Scary is when your life falls apart, and turns into pure hell over a period of 20 years, while you're standing by watching helplessly because, a group of evil and spiteful people are hellbent on destroying you and your life via black magic for a mistake you have no recollection of making. And when you seek help, you find society in general refuse to understand this, and as a result, you can't get effective assistance when you need it. But what you describe sounds like an energy imprint, much like how a tape recording is made, which is then is played on repeat. Quite harmless. I would be interested in reading other accounts of similar incidents. Sounds spooky. Not sure it was the woman in white though as logic would say you would have seen her. Unless she was the 'Woman in Black'. Sleep tight.